to investigate sensitive and potentially embarrassing affairs of government. In our democracies, and as Africans, Chapter 9 institutions are a necessity. Not because we are Africans, but because we have suffered the most at the hands of previous regimes that were never accountable to anyone, namely, apartheid, colonialism and dictatorships together with post-independence civil wars. Further, institutions designed to uphold accountability are inherently linked with (good) governance and the legitimacy to govern. Some of the dictates of democracy is that, government can only act as provided for by law, and that any action that goes beyond the perimeters of what is legally provided for should be accounted for, through various mechanism such as courts. Accountability goes to the centre of the rule of law and, particularly so, good governance. 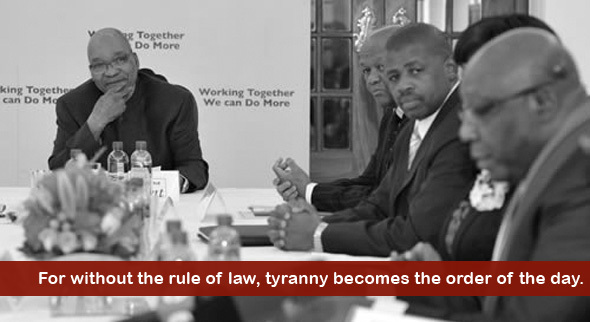 For without the rule of law, tyranny becomes the order of the day. It is important, as shown by the report and the enabling provisions in the Constitution that no man or women is above the law, regardless of rank. Need it be pointed out that countries with a good track record of observing the rule of law also have a strong and lively democracy- therefore, there is an inherent link between the two. In conclusion, the role of Chapter 9 institutions is primarily to strengthen democracy, and part of this is ensuring that accountability, within those who govern, becomes a norm, not an exception. Whether the National Assembly will pursue the Public Protector’s recommendations, some against the President, should be of no consequence to the operations of the office of the Public Protector. This report has laid the necessary foundation. Kenneth Sithebe holds a Bachelor of Laws (LLB) from the University of Pretoria and is currently an LLM candidate at the University of Pretoria (South Africa). He His main areas of research are human rights, international criminal procedure and women’s rights.